Thank you so very much for this, Lee! It comes at the perfect time, as today was the first day it was nice enough to be thinking of gardening. You are very welcome Lisa. I had written a few posts about perennials so I decided to put all the information into one handy chart! Lee, the first thing I thought was wow, just plant all these and you have a wonderful garden! Thanks for putting together such a lovely and an informative chart! My pleasure Deb. These are all wonderful plants and I have used them in my own gardens and in the gardens of clients. Glad to hear the information will be useful to you! What a great chart, that must of taken a lot of work, but it's perfect for reference. I pinned it, hope that's OK with you. If not just let me know, and I will delete it. Question? Have you ever grown a miniature Buddleia? Mine has extensive winter damage, and while I've grown the big guys, I have never grown the small ones...and now I see a post on your side bar...will check it out. Glad you like it! I am honored that you want to share it...please just make sure my copyright is on it. It did take a bit of work but I prefer organization so it was something I wanted to do over the long winter. As far as miniature Buddleia, it is one of my newest favorites in the garden. Mine hasn't really started showing any signs of life yet and won't until the end of April-beginning of May but they are pretty hardy. I have been enjoying them for three years now. Olá amiga, vim desejar-lhe uma abençoada semana, e agradecer sua carinhosa visita ao meu cantinho. Thank you for visiting Marie and for leaving a comment. Thank you Beth! I am glad you found this to be resourceful. I guess organization works! This is certainly a handy chart and the other links are a great resource as well. Have a wonderful weekend! Glad you enjoyed Jennifer. Have a great rest of the weekend! Great idea, Lee. Very handy and the photos a nice touch. Thanks Donna. These are some of the most reliable and long blooming perennials I have come across over the years that I use in my designs. Such a pretty landscape, those are awesome flowers, I wonder why lavender isn't included. Hi Louie. Thanks for visiting and commenting. Lavender is another good one. 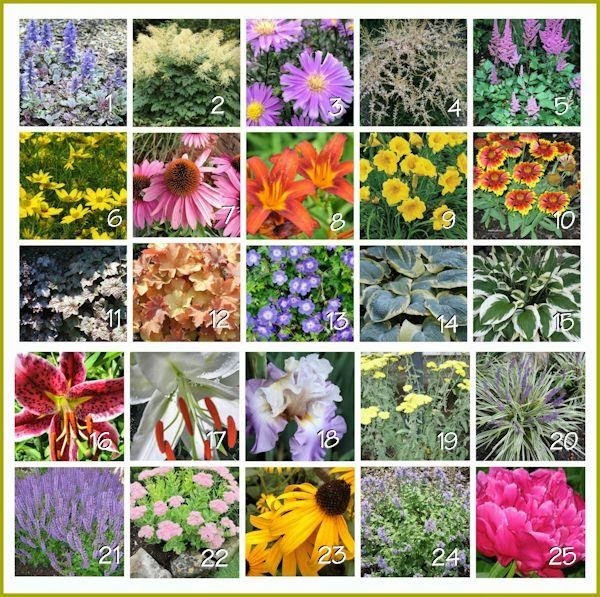 There are so many wonderful perennials...so many I would need a bigger chart! These are the ones I most often use due to their hardiness and blooms/foliage.